On Saturday, February 28th, 2015, KPPI was conducted in Bitung. Bitung city is one of the cities in North Sulawesi province. Bitung city is located in the northeast of Minahasa land. Bitung city region consists of the land area located at the foot of the mountain Duasudara and an island called Lembeh. Many residents of Bitung city are from Sangir tribe. 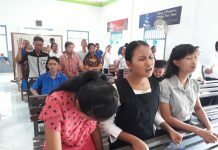 KPPI Bitung in cooperation with GSJA Bitung which is pastored by Rev. John Polii. 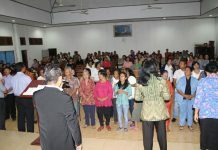 KPPI service started exactly at 6.30 PM which was attended by several churches from GBI and GSJA. The worship leader led congregations to praise God. Then followed by airing a testimony film that awakened the faith of the present congregations that evening. Word of God was delivered by Rev. 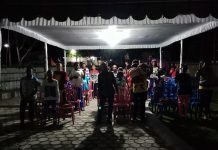 Andri Thio, taken from James 5:16, invited all the congregations to believe in the Lord Jesus. The Word was continued from Luke 7: 1-10 about the faith of a centurion whose servant was sick. The servant of God invited the congregations to believe fully to the Lord Jesus as Lord and Savior in their hearts. As healing prayer about 10 people came forward to be prayed by God’s servants and the counselors. Praise God in that evening God’s miracles revealed, there was a young man who was healed from a tumor on his neck and his tumor broke, the pus flew and the tumor became flat. Even until the end of the service had already finished that young man still kept pulling out the pus and he looked fresher and healthier. Hallelujah! At the end of the service the whole congregations praised God and they returned to their homes with a new joy. Glory to the Lord Jesus!